While nothing can quite beat the thrill of seeing the stars up close with the naked eye by peering through a lone telescope, astrophotography takes things to the next level by providing clearer pictures of celestial bodies and allowing you to share their beauty with others. When I talk about astrophotography, I am referring to photographing deep sky objects (DSO’s) – namely galaxies and nebula. Planetary photography requires different considerations. What Features Should You Aim For In an Astrophotography Scope? It is important to understand that unlike visual astronomy, where aperture rules, for DSO photography optical speed rules. Some of the greatest astrophotography pictures were done using a small camera lens – so size is not the primary consideration. The need for speed is the result of how signal-to-noise-ratio (SNR) is measured. Compared to daylight targets, DSO’s are extremely dim. The more photons we capture in our pixels during our available time under the stars, the better our picture will look. We measure the number of photons captured in terms of SNR. More photons counted in the pixel equals more SNR. More SNR makes for a smoother picture. Optical speed refers to how fast the photons are flowing through the system and getting into our camera’s pixels. The faster the better. While fast optics can increase “signal,” to reduce noise involves other considerations. Reducing noise can best be accomplished by photographing under dark skies without light pollution, or by using special narrowband filters. Speed is indicated by the focal ratio. The focal ratio is the focal length divided by the aperture. Speed changes by the focal length squared. So an f/4 system is 4x faster than an f/8 system. If you are going to do DSO photography, you will need an equatorial mount – as opposed to altitude-azimuth mount (Alt-Az). An equatorial mount aligns with the earth’s pole. An Alt-Az mount will induce field rotation over a long exposure. The size of your telescope will be controlled to a large extent by the size of your equatorial mount. The mount is the foundation of your DSO photography system. In general, the better the mount, the better your performance. Like taking a picture from a ship, the earth is a moving platform. The earth is rotating about its axis and it is rotating about the sun. 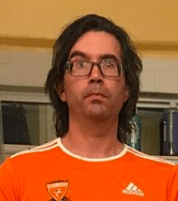 DSO’s are fixed – for our purposes anyway. An equatorial mount holds the camera in the same orientation in space while the earth moves below it. Most DSO photographers will caution not to skimp on a mount. For the entry level mounts, it is best to keep the load at about 50% of the rated load. For small refractors, an entry level 30lb capacity mount is the minimum size mount to use, and these run about $700 to $800 (US dollars). Taking one step up to the about 45lb capacity range, a medium sized mount, there are several good choices in the $1,500 to $2,000 range. But these are the starting points. Top performing mounts begin around $3,000 and up. If you don’t want to read the whole guide, below is a list of 4 best telescopes for you to use in astrophotography. Take a look and see which one you’d like to be your personal companion as you discover and map the wonders of the universe. Which Telescope Type Is The Best For Astrophotography? As there are many different types of telescopes available for use in this hobby, choosing the top astrophotography telescope might take some effort on your part, but it’s a totally worthwhile investment of your time. For beginners, when choosing a telescope, most DSO photographers recommend starting with a small refractor. A refractor consists of a convex glass lens that focuses light at an image plane. There are two basic types of refractors – achromatic and apochromatic. A convex lens acts like a prism to bend light to a focal point. When light is bent, like with a prism, the light disperses into its different component wavelengths. When light’s different wavelengths come to focus at different points it results in chromatic aberration. Special low dispersion glass is used in telescopes to minimize chromatic aberration. Achromatic telescopes generally consist of two pieces of glass that bring the dispersing light to the same focal point. An achromatic lens system, however, only fully brings together the blue and red wavelengths, leaving the green wavelength out-of-focus. A more improved system is the apochromatic system. This usually consists of three lenses, and this system brings all the light rays to the same focal point. For astrophotography an apochromatic telescope is recommended. Though for narrowband imaging, since it is a narrow wavelength of light, an achromatic telescope would work. Most astrophotographers, however, purchase apochromatic telescopes because these telescopes usually have better quality focusers and are usually better quality overall. A small refractor is good for a beginner because it is more forgiving of your mount’s tracking limitations, less prone to revealing polar alignment errors, and in general is more forgiving overall and easier to use than other types of scopes. Furthermore, there are many great targets for small refractors that are great for both the beginner and the advanced photographer. It is important to know that many objects in the sky are much larger than we might realize. Many nebula cover an area in the sky equal to the size of multiple moons. Small refractors have a large field of view (FOV) and capture these targets nicely. Your image FOV is controlled by the telescope’s focal length and the camera’s sensor size. While you can get started taking DSO photographs using a camera lens, a small refractor telescope is more optimized for focusing at infinity, will have a vixen base plate for attaching to a mount, it may have an adapter for a guide-scope, and will have a focuser system suitable for a dedicated astrophotography camera. A small refractor enables one to get started with just a small or medium sized mount. While most people will say get the best mount you can afford, when using a typical small and lightweight refractor, such as an 80mm aperture refractor, the mount tolerances are much less demanding than when using a heavier and longer focal length telescope. The greater the focal length, the greater the magnification. Greater magnifications reveal your system’s limitations more than less magnification. This is why a small refractor is great way to start. If you can handle the cost and the mount’s weight, I recommend starting with a medium sized mount. Many refractors have a native focal ratio around f/7. Most small refractors can accommodate a .8x focal reducer. An 80mm f/5.6 telescope will have a focal length equal to 80mm x 5.6 = 448mm. Focal reducers speed the optics and create a wider FOV. These reducers also flatten the field. Refractor optics create a perfect image along a curved plane, but camera sensors are flat. A combined focal reducer and field flattener will correct this optical situation and create a flat image at the sensor. Smaller DSO objects require a larger focal length telescope to adequately resolve detail. As one gets more advanced, many astrophotographers expand into different focal length telescopes. 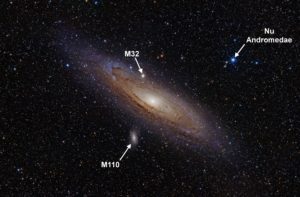 While the Andromeda Galaxy, M31, is about 3 degrees wide (six moons wide), and the Triangulum Galaxy, M33, is about 1 degree wide, most galaxies available to the amateur astrophotographer are between 10 arc minutes and 30 arc minutes in size. Many planetary nebula and supernova remnants are in this same size range and smaller. For these smaller targets, a 130mm (5in) refractor might be suitable, as well as a typical 8in Newtonian telescope, or a Schmidt Cassegrain Telescope (SCT). These larger size telescopes require better mounts to handle both the heavier load and the higher focal length tolerances. 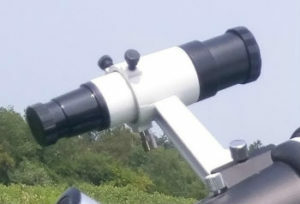 A minimum of a medium sized mount is recommended for these telescopes. You don’t need to go too large. The earth’s atmosphere puts a limit on how much detail can be revealed by light traveling through the atmosphere – this is known as the “seeing” limit. 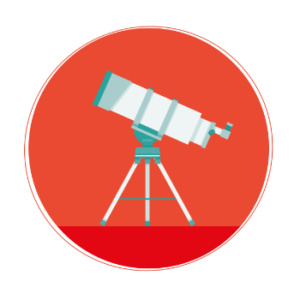 This is why professional observatories are built on mountain tops – it reduces the amount of atmosphere the light has to travel and reduces the amount of distortion that the light experiences. Once you are capturing a picture at the limit of the seeing resolution, further magnification does not reveal any additional details. Given the typical sized camera pixels in today’s cameras and the typical seeing conditions, a focal length of around 800mm to 1200mm is about the limit for most amateur astrophotographers. You can go longer in focal length, but you begin to operate at less than the ideal SNR photon capture rate compared to a shorter focal length system. A Newtonian reflector telescope consists of a parabolic mirror that shines its light onto a secondary mirror, and the secondary mirror directs the light to a focuser on the telescope’s side. Newtonians require an added step called collimation. Collimation is done by adjusting three mirror screws at the back of the telescope. This is done so that the light is directed at the center of the focuser and at a right angle to the sensor. Collimating a telescope is not difficult but does take a little practice and learning. I find that a simple $5 collimation cap is the fastest and easiest way to get good collimation. Using an autocollimator can further fine tune collimation. Laser collimators have their drawbacks, and a laser’s convenience is not essential when you can reach the mirror’s adjusting screws while looking down the focuser. With a Newtonian you will also need a coma corrector. As the you move further from the mirror’s center, the optical properties of light cause distortions in the image known as coma – “coma” because the stars look like comets. A coma corrector will correct this optical distortion. A big advantage to Newtonians is that most are optically fast – most are around f/4. A downside to Newtonians is the size and weight. Because of their size, a Newtonian is more prone to catching the wind. The size and weight will add more load to the mount compared to a small refractor. Adding additional small counterweights closer to the mount head and facing the camera downward in the home-position can reduce the Newtonian’s load impact on the mount. A basic Newtonian can be a great bang-for-the-buck. They are usually much less expensive than refractors – especially as one increase in refractor size and quality. Many people end up upgrading the focuser on the basic Newtonian astrographs, resulting in some offset in the cost savings – but still a very good deal none-the-less. One company is now selling carbon fiber Newtonians with advanced focusers. The 8in (200mm) f/4 sized Newtonian is a popular size, and has an 800mm focal length. SCT’s are a combination of a refractor and a reflector. An SCT consists of a spherical mirror that utilizes a specially curved piece of glass, a Schmidt corrector plate, at the front to correct the light rays into a usable image. SCT’s serve a good dual role for high focal length planetary imaging. While most SCT’s are a native f/10, they accommodate a .63x or .7x focal reducer. An 8in (200mm) SCT with a .7x focal reducer will have a 1,400mm focal length. There are two basic types of SCT’s, a regular SCT, and an aplanatic flat-field SCT, such as the Celestron Edge. Like a refractor, the resulting image is curved. An aplanatic SCT flattens out the image plane for the camera sensor. This is especially important with the advent of full fame size camera sensors. As you move further from the mirror’s center, further off axis, like with coma, the image field curvature gets worse. For smaller sized sensors, however, especially a planetary imaging size sensor, a regular SCT might be sufficient. When using an SCT for DSO photography, most people will recommend using an off-axis-guider (OAG). This is to eliminate differential flexure and mirror flop between the guiding system and the main camera. Like collimation for a Newtonian, using an OAG takes some practice and learning. One advantage often cited for refractors, especially for the beginner, is the ease of use – you do not need to collimate and you do not need an OAG. Below are examples of the various types of telescopes discussed above and that are popular among amateur astrophotographers. When choosing a telescope, it is best to look at all different brands and read reviews. Cloudy Nights Forum and Astrobin are great resources to communicate with other amateur astrophotographers about various telescopes. This is a great starter scope. Though, for a little more money some choose to upgrade to the version with higher performing glass with the larger focuser. This is very similar to the Explore Scientific model. This model comes with a carbon fiber housing. While carbon fiber is lighter, carbon fiber’s biggest advantage is that it does not expand and contract as much with temperature changes the way an aluminum body will change. This reduces the need to refocus during the night as the temperature changes. This is a great scope. Many people upgrade the focuser. It is compact for the focal length it provides. It is also great for imaging planets. There are three main camera options for astrophotography – DSLR cameras, one-shot-color (OSC) dedicated astrophotography cameras, and mono camera astrophotography cameras. A DSLR is a great way to start. Most people already own a DSLR. The DSLR is connected to the telescope through a T-adapter. There are two main downsides to DSLR’s for astrophotography. Over long exposures and over long operation time all cameras create heat. The heat causes electrons to be released in the pixels that mimic photons. These unwanted electrons degrade the image quality. Dedicated astrophotography cameras have a thermoelectric cooling system that reduces this effect. DSLR cameras also have a light filter that mimics the light wavelength range that the human eye sees. The problem is that emission nebulae emit light mostly in Hydrogen-alpha wavelength, 656nm. DSLR’s only let in about 20% of this wavelength. This puts a severe limit on DSLR’s with respect to many typical astrophotography targets. For those ready to invest in a dedicated astrophotography camera, the choice is between an OSC and mono. OSC has the benefit of getting color data automatically. These are best for use at dark sites. Mono cameras require color filters to create color. This also requires extra processing steps. 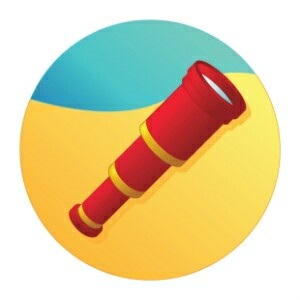 The benefit is higher quality picture data and more processing control. Mono cameras also allow for use of narrowband imaging. Narrowband imaging is used to image emission nebula. Narrowband photography can be done very successfully from highly light polluted locations. Another choice with dedicated astrophotography cameras is the choice between a CCD style system versus a CMOS style system. CMOS astrophotography cameras are relatively new and offer a fantastic price advantage over the CCD style cameras. The below books are often cited as great resources for both beginners and more advanced photographers.